This topic took several months to research, so I haven’t posted in a while. I’m finally wading into this after years of giving talks without being able to give clear advice on how to handle gas after an earthquake. It can be confusing. On the one hand, it seems safest to turn off your gas, but on the other hand, the official advice from various utility companies and emergency organizations is to not turn the gas off unless you suspect a leak...and yet on the third hand, many sources are telling you to get automatic gas shut-off valves. How do we fold our three hands together to make sense of these seemingly mixed messages? I’ve spoken over the last few years, and especially the last few months, with various earthquake safety experts, fire marshals, fire department representatives, Pacific Gas & Electric (PG&E), and Southern California Gas (SoCalGas), and here’s my attempt to make sense of it all. First of all, should you turn it off? If a quake occurs, and you are in your home because you wisely did not attempt to run out of it in the middle of the quake, first determine if you smell gas. If you do smell gas, open a window if you easily can, and get everyone out of the building right away; do not flip electrical switches on or off, do not open refrigerators with door-switched interior lights, do not use telephones, and do not do anything else that could cause a spark. Then turn off the gas that leads into the home. This means you need to already know how to turn off the gas. Single-family homes and small apartment complexes typically have pretty obvious gas meters outside; you should know where yours is, and know how to turn it off. 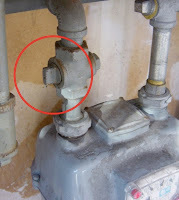 This photo shows a typical gas meter. See that simple metal circle on the pipe with the raised ridge (tang) that is parallel to the pipe? That means the gas is on. If you were to turn it 90 degrees with the wrench so that the ridge is perpendicular to the pipe, as if it was blocking it, then the gas would be off. If you live in a large complex, ask the manager (ahead of time) how to shut off the gas. If you don’t smell gas, then listen for hissing noises, and go down to the meter and see whether the dial is spinning even when you aren’t using any gas appliances. These would also indicate gas leaks, and you should turn the gas off. The gas companies say: if you don’t suspect a leak, don’t turn off the gas (see below). 1) Find your meter so you know where it is. 2) Get an appropriate wrench that can fit the tang and is capable of turning the valve, and attach it with wire to the meter so that you don’t have to go find one at the last minute. 3) Test the valve by turning it slightly; not off, but just a little bit. There’s a good chance that you can’t move it! These valves freeze in position due to being exposed to outside conditions for years, and if you can’t turn off the gas when you need to, that’s what is technically known in emergency management circles as “A Bad Thing.” Fortunately, if you can’t move it, you can call your utilities company and they will send someone out to fix it for free; at least that is the case with PG&E. If you suspected a leak and turned off your gas, don’t even THINK about turning it back on until you have the utilities company come to check and possibly repair the gas lines. While it may seem like the safest thing to do is to simply turn off your gas even if you don’t suspect a leak, turning it off has consequences also because you are not supposed to turn it back on afterward. If you turn it off without suspecting a leak, then there’s no way to know if there is actually a leak that would have just taken longer to be noticed. Then you turn the gas back on and start filling your home with gas if there really was damage to the gas line. That is, your reason for turning off the gas in the first place will never end until someone like PG&E or a qualified inspector can tell you if there is a leak. Plus, there are various scenarios in which re-establishing the main gas flow to pilot lights and appliances could be dangerous, especially with post-quake uncertainties. For these reasons, the gas companies don’t want you to turn your gas back on if you have turned it off after an earthquake. Note that it can take weeks for them to visit large numbers of customers throughout the metropolitan area, so if you turn off your gas, you may be without gas for weeks. After the 1989 Loma Prieta earthquake, PG&E tried in vain to convince their customers to NOT turn off the gas unless they suspected a leak, including use of local media; but 80% of the customers in San Francisco turned off their gas and it took 3 weeks for PG&E to restore gas for everyone, despite the use of outside contractors to augment their ranks. SoCalGas gives advice on its website that is identical to PG&E’s advice: only turn off the gas if you suspect a leak, and don’t turn it back on yourself. The Red Cross’ advice is similar: turn off gas if you smell it or suspect a leak, and don’t turn it back on. Despite this, I have spoken with a couple of independent earthquake safety experts and a local fire marshal who think everyone should turn off their gas, figuring that it could cause annoyance to large numbers of people but could also prevent hundreds of fires. If you do this, though, be prepared to wait a long time before you have gas again. I do not believe that complete consensus will be reached on this point, but it may be moot if you have an automatic shut-off valve; read on. “Now wait a minute,” you say, “if I am not supposed to automatically turn off my gas, why am I being urged to install an automatic gas shut-off valve? ?” PG&E is officially neutral about automatic shut-off valves. The City of Berkeley recently adopted a policy that requires automatic gas shut-off valves to be installed in all buildings being built or renovated (although the Berkeley Fire Department is neutral), various other communities have similar policies, and some insurance companies give you a discount on premiums if you have an automatic gas shut-off valve. But doesn’t this contradict the official recommendation to not turn off your gas unless you suspect a leak? PG&E is taking a very pragmatic view of this issue: even though they might shudder at the idea of a whole community having its gas turned off, they are also aware that it’s being required and encouraged in many places and won’t try to interfere with that. Berkeley initially did not require these valves for several reasons, including that the earlier versions of the valves were so sensitive that they would get shut down by passing trucks, but they are better now, and should only trip if the building moves in a ~5.4 magnitude earthquake or higher. Plus, there are real advantages to automatic shut-off valves that I find compelling. The concept of only turning off the gas if you suspect a leak assumes that you are home to be able to make this decision. If nobody is home and there is a leak, you’ll come home to a house full of gas and potentially blow it up when you turn on the lights. If you have pets who are home while you are at work, they could inhale gas. Furthermore, the gas that builds up in your home may impact your neighbors in various ways. So an automatic shut-off valve minimizes the chances that a gas leak will cause problems while you are away. However, turning off the gas is turning of the gas, whether you did it or an automatic shut-off valve did it. These automatic shut-off valves are sometimes marketed as being very easy and straightforward for the consumer to reset, which sends mixed messages to the public about whether they should reset their automatic valves after a quake. PG&E says: leave it off. If your automatic valve shut off due to an earthquake, then it’s the same story as if you had turned it off yourself: wait for the utilities company to turn it back on in case there was damage to the lines. SoCalGas has said on its website that you may reset an automatic valve after a quake, but they recommend that you don’t (http://www.socalgas.com/safety/valves.shtml accessed 4/27/13; I’ve pointed out the mixed message to them, and this wording may change). The reason that these automatic valves are sometimes described as being easy to reset is that if your automatic valve keeps turning off because of a passing garbage truck (or some kid bouncing a basketball off your house, or perhaps an errant overfed butterfly if you have one of the old valves), then they make it theoretically possible to turn it back on IF YOU KNOW WHAT YOU ARE DOING. You would need to follow the manufacturer’s instructions and ensure that you are not restoring gas to unlit pilot lights that are allowing that gas to seep into your home, even in the absence of a quake. Many modern appliances use spark igniters rather than constantly lit pilot lights, and modern pilot lights have safety features that shut off the gas flow if the flame is not lit; these require you to turn a dial to a special pilot light position to light it. If you have older pilot lights, then re-establishing gas to an unlit pilot light and lighting it afterward can be dangerous; have the utilities company do it. However, PG&E makes the blanket statement that they want you to never reset an automatic shut-off valve, even if it shut down for non-earthquake reasons; they want to do it. SoCalGas states that the California Public Utilities Commission requires that “only SoCalGas or its certified contractors are authorized to operate the gas shut-off valve” (in its jurisdiction). There’s no way I’m going to make a recommendation that contradicts the law and official safety recommendations of utilities companies. You might think you know what you are doing, but you might end up surprising yourself the hard way. At least in a non-earthquake situation, you won’t have to wait very long for the gas company to reset your service. And if the kid keeps hitting your valve with the basketball, sign her up for a league. If you need to have your gas turned back on, don’t assume the utilities company will know that you need restoration; you may need to inform them. If phones and computers are down, this could be difficult, but between flagging down utilities workers in the street, waiting for communications to be restored, or finding other ways to communicate, you’ll reach them one way or another. They will also sweep through neighborhoods sooner or later. Some of you might be thinking to yourself that you turn your pilot lights on and off all the time, so what difference does it make to restore gas and relight the pilot lights? However, there’s a fundamental difference between turning gas on and off to a furnace or stove, and restoring it to the whole building, especially given the uncertainty caused by an earthquake. In this case, leave it off. This is a good reason to keep some compact foldable camping thermal blankets in your emergency kit! Those of us who have gas appliances deal with them every day, and it’s easy to take gas safety for granted. Please remember that many fires after earthquakes would not have occurred if people had been more respectful of the explosive fumes coursing through the pipes in their homes. Firm knowledge of how, when, and if to turn gas on and off after an earthquake is wiser than basing your actions on shaky grounds. Thank you for this excellent and informative post. I would never have thought of turning the gas back on as particularly hazardous. What about at work what should be done about the gas supply there after an earthquake? That's a great question... wish I had a great answer! I suspect that the employer will have their own gas policy and it's doubtful that the employees can even find the gas shut-off. However, if you have a familiar enough relationship with your employer, you could certainly raise the topic. Really good question; I must admit that I haven't been thinking along those lines but it's presumably just as important to not blow up your work as it is to not blow up your home. I have 20 years experience in the natural gas distribution field as a company service technician, and our company stance is for a customer to NOT turn off the gas "just because" there is an earthquake. As stated in this article, it could take days or weeks to get your gas back on. HOWEVER... if you do have a broken pipe or smell large quantities of natural gas, our company would like you to LEAVE THE AREA and call instead of turning off the meter because turning off a meter with a gas leak could in fact cause a spark and thus an explosion or fire. Thanks for this comment, and I'm not surprised that official recommendations vary. While I want to present a balanced range of opinions and recommendations, I do want to mention that this advice contradicts that of the main utilities companies in the San Francisco Bay Area and the LA area that I consulted when writing the article. Interestingly enough, if you look up what PG&E has on its website about turning off gas, in one place, it gives advice that sounds very much like that presented in the comment: clear the area and call 911 from a phone away from the residence. However, on the page that describes how to turn off the gas, there are comments to discourage people from doing so in the event of a gas leak, and they recommend that people turn off the gas but only if the leak is suspected. The advice to not turn off gas if leaking also conflicts with the practice of the San Francisco Fire Department, which teaches its Neighborhood Emergency Response Team volunteers about turning off residential gas supply if necessary and includes that in the list of things they will probably be asked to do. One question that occurs to me is how a spark would be generated by turning a mechanical shut-off valve. I know that light switches and electrical implements carry the risk of sparking and should not be used if gas leak is suspected, but I'm surprised to hear that a spark is a potential outcome of turning that valve. At any rate, just like the debate over whether you really can't turn the gas back on, and the debate about the pros and cons of automatic shut-off valves, the gas issue is not one on which consensus is common! It's a shame, and I hope that the Real Experts (I just pass along the info from Real Experts) can come to a consensus on all of these issues so that the public can get a unified message! There are 2 ways shutting it off could spark: static, and metal-to-metal contact. Just like touching a doorknob or car, a static build-up could discharge a spark. As for the metal-to-metal contact, any time you have said contact you can get a spark; this is especially true when the valve is stuck or difficult to turn and the wrench slips. Is it really true that using a cell phone could cause a spark? I see that at gas pumps and use caution, but I know in the case of an earthquake I would want to make a quick text to other family members. Any advice? That's a very good question; I've been confused about that as well. I have signs at gas stations sometimes that warn against using cell phones near the pumps, although it seems like many people do anyway. If you DO have a gas leak, according to my local utility company PG&E's website, "Do not use anything that could be a source of ignition, including cell phones, flashlights, light switches, matches or vehicles, until you are a safe distance away." I would say, however, that if you suspected a gas leak (smell, hissing sound, meters running for no reason), your first priority would be shutting off the gas, not texting people. If you didn't have any reason to suspect a leak and felt comfortable remaining in your home, then cell phone use would presumably be ok.